But you don’t want to choose just any trip to Israel. When you go to the Holy Land, the Bible teaching is what matters! When you travel with Greg Sanford and DPH Travel, you’ll have an expert Jewish guide who is very familiar with the Hebrew Scriptures, the Hebrew foundations of Christianity, the life and times of Jesus the Messiah, and the birth of the church out of Judaism. You’ll also have the strongly dispensational teaching of Dr. Randy White, who has toured Israel for many years and taken hundreds of people to the Holy Land. This trip has an ALL-INCLUSIVE price. The trip price of $3,975 (get a $125 per person cash discount when paying by check or money order) includes airfare (see below for details), three meals daily from arrival to departure, hotels, luxury coach exclusive to our group, expert guides, entry fees, bottled water, even tips and taxes. Departure from the USA. Flights are included in the price from Philadelphia (other airports available upon request) and provided through DPH Travel. Today we arrive in Israel! Assistance is provided at the airport through customs and porterage unto our first-class bus that will be exclusive to our tour. After a 45 minute drive, we will enjoy rest at the Leonardo Hotel in the coastal city of Netanya, north of Tel Aviv. Drive to Caesarea named in honor of Augustus Caesar who gave the territory to Herod as a gift. Previous port cities at that time were established in the vicinity of natural bays, but Herod began building an artificial port, one of the largest in the Middle East, and the most sophisticated. 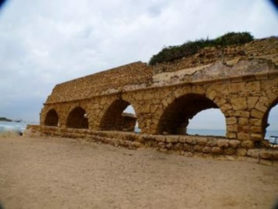 Caesarea played na important role in early Christian history. Here the baptism of the Roman officer Cornelius took place; (Acts 10:1-5, 25-28) from here Paul set sail for his journeys in the eastern Mediterranean; and here he was taken prisoner and sent to Rome for trial. (Acts 23:23-24). Continue to Mt Carmel which has been a symbol of beauty and splendor, with its green woodlands, its forests and its magnificent wild landscapes. Mount Carmel is also the mountain of the Prophet Elijah. According to the Biblical account, after years of drought, Elijah competed against four hundred of Baal’s prophets, all servants of King Ahab, to see who could make it rain (1 Kings, 18): whichever of them could persuade “his” god to send down rain would be recognized as a true prophet. Driving eastwards towards the Sea of Galilee. On our way, we will visit Megiddo, also known as Armageddon. The site is located at a strategic entrance through the eastern Carmel hills where an ancient trade road (Via Maris) links the North (and Assyria) and South (Egypt). Megiddo has played an important role in the history of the Biblical Israel. Dinner and overnight Gai Beach, Tiberias. 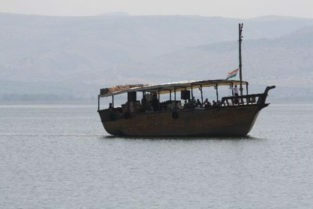 We will spend the day around the Sea of Galilee. Starting with a boat ride that will take us to Capernaum, sometimes called “the town of Jesus, where we will see “The House of St. Peter,” which apparently served as a meeting place for early Christians. In it lay many fragments of plaster bearing Christian symbols and inscriptions including the names of Jesus, Simon and Peter. Tabgha, on the northern shore of the Sea of Galilee, is accepted traditionally as the site where Jesus fed 5,000 people with five loaves of bread and two fish (Matthew 14:13-21). The Church of the Multiplication of the Loaves and Fishes was built here in the fifth century. At Mt of Beatitudes, located on a low hill near Tabgha. Jesus is believed to have given the Sermon on the Mount here. The octagonal-shaped Church of the Beatitudes (to symbolize the eight beatitudes as described in Matthew 5:3-11). Magdala (near present-day Migdal) is located on the western coastline of the Sea of Galilee and at the eastern foothills of Mount Arbel. It is at the crossroads of Jewish and Christian history. It is known traditionally in Christian sources as the birthplace of Mary Magdalene. She is named at least 12 times in the gospels where she is described as one of several women traveling with Jesus and his disciples and personally supporting his work. She was one of the women who witnessed Jesus’ crucifixion and planned to tend to his body after the Sabbath. Mary Magdalene was the first eyewitness of the risen Christ and was commissioned by Jesus to inform the disciples of his resurrection. It is also certain that during his ministry Jesus taught in Magdala. Dinner and overnight Gai Beach Tiberias. Today we leave Galilee and head south along the Jordan River. Our first stop will be Gideon’s Spring (Ein Harod), where we will see the spring, the hill of Moreh, and the battle site for Gideon’s battle with the Midianites. You will see how accurately the Bible describes the geography in which Biblical events took place. Also on our agenda for today is the ancient Roman city Beit Shean, one of the cities of the Decapolis. WOW will be your only response to the largest ancient Roman city in Israel. With lunch and shopping in Qumran, you will learn about the Dead Sea Scrolls, catch your first glimpse of the Dead Sea, and be welcomed to desert life in the Judean wilderness. We will be staying at the Hotel Daniel Dead Sea, where you will have an opportunity to float in the dead sea. Don’t forget your swimsuit! The day will be spent in the Dead Sea area, starting with Masada. In the days of the Great Revolt, the last of the rebels against Rome entrenched themselves at Masada, and turned their desperate fight into a symbol of the struggle for freedom. 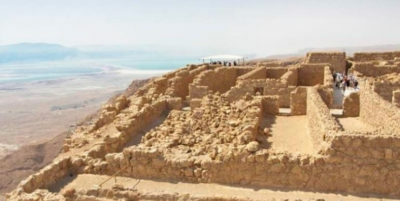 Because of the enthralling historic events that took place on the mountain, and the archaeological finds that have been revealed there, UNESCO has declared Masada National Park a World Heritage Site. Continue to Ein Gedi which is the biggest oasis in Israel. It has springs and waterfalls, and flowing brooks at the foot of the cliffs, home to ibexes and rock hyraxes. Ein Gedi is mentioned a number of times in the Bible. It is one of the towns of the tribe of Judah in the desert, and is where David concealed himself when he fled from King Saul. We will also enjoy an amazing view of the Judean wilderness at Metzokey Dragot. Dinner and overnight Dan Jerusalem. Our time in the Old City will begin with a tour of the Western Wall and the Western Wall tunnels. You’ll see the vast size of the Herodian Temple Mount structure and learn some of the reasons why this wall is the most sacred spot in Jerusalem. At the southern end of the Temple Mount, we will stand on the Southern Stairs to see into the past, present, and future. Looking south, you will see the City of David, which is the next stop on our journey. After the City of David, we will go into the Jewish and Armenian quarters of the ancient city, learning about Jewish life in both modern and ancient Jerusalem. As we are here, you will literally see fulfilled prophecy right before your eyes. Dinner and overnight Dan Jerusalem. The Mt. of Olives has always been an important feature in Jerusalem’s landscape. Jesus made many visits to the Mount of Olives (Luke 21:37). In fact, it was “usual” for Him to go there when in the vicinity of Jerusalem (Luke 22:39). The Bible records Jesus’ visiting the Mount of Olives three times in the last week of His earthly life, and each time something of significance happened. Jesus’ third visit during the week of His passion was on the night He was betrayed. That evening began with the Last Supper in Jerusalem and ended in the Garden of Gethsemane on the Mount of Olives. During that last Passover meal, Jesus washed His disciples’ feet and then revealed Judas as the betrayer (John 13:1–30). At the conclusion of the meal, Jesus established the New Covenant and instituted the Lord’s Supper (Matthew 26:26–29; 1 Corinthians 11:23–26). Then He took His disciples to the Garden of Gethsemane located on the western slope of the Mount of Olives. There Jesus prayed in agony as He contemplated the day to come. Walk the “Stations of the Cross“, which designates a stretch of road between the Antonia fortress and Golgotha, along which Jesus Christ walked bowed under the weight of the Cross. Visit the Western Wall, the Kotel, the most significant site in the world for the Jewish people. 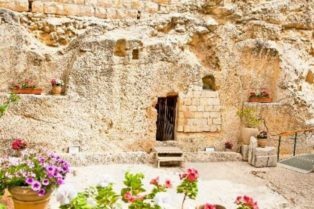 We will end the day at the Garden Tomb, believed by many to be the garden and sepulcher of Joseph of Arimathea, and therefore the site of the resurrection of Jesus. Dinner and overnight Jerusalem. After transfer to the airport (including assistance and porterage at the airport), we will depart for home. We left excited, we will come home energized! Travel protection is highly recommended. Travelers have the choice of purchasing coverage through DPH Travel, through their own agent or provider, or foregoing coverage. Cost of coverage in the Group Deluxe plan through DPH Travel is $242. For coverage of pre-existing conditions, the plan must be purchased within 15 days of your initial deposit. Coverage purchased after this time is valid except for pre-existing conditions. A “Group Deluxe with Cancel for Any Reason” is available for those who would like reimbursements for non-covered reasons. Cancellation for a covered reason is reimbursed at 100%, and for a non-covered reason at 75%. All other coverages are the same as the Group Deluxe plan. Cost of the Cancel for Any Reason option is an additional $121 (total of $363). You may select insurance options when you register, or at any time by contacting DPH Travel.